As the global asset management industry prepares for the extensive new research procurement reforms required by Europe’s new MiFID II regulations, a number of vendors are offering new solutions to facilitate implementation. 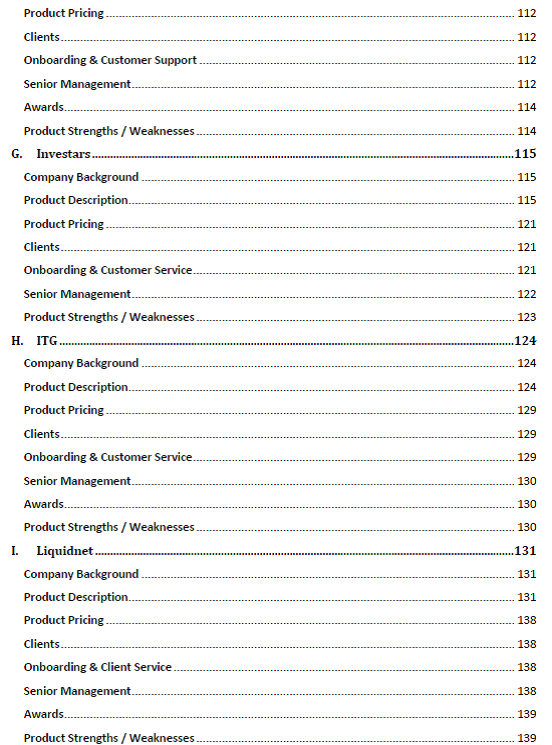 To help assess the various options available to asset managers seeking to comply with the new MiFID II research inducement rules, Integrity Research Associates has conducted a “first of its kind” analytical review of the ten firms offering services designed to meet the new research governance requirements as well as facilitating research payments. Integrity’s proprietary analysis is provided in this comprehensive 150 page study. Integrity Research employed a thorough research process in producing our analysis of the burgeoning RPA solution provider marketplace. In the 4th quarter of 2016, we started this report by interviewing commission management, research and operations professionals at two dozen asset managers in both the US and Europe. The purpose of the interviews was to identify the factors asset managers felt were most important in their selection of research procurement vendors and the questions they would ask these providers. During the 4th quarter of 2016 and 1st quarter of 2017, we participated in face-to-face or online demonstrations of the solutions offered by each of the vendors. We followed up each demo with meetings or calls with senior management responsible for these platforms to address specific questions we had, and to request data about each provider and their RPA offerings. This enabled us to write the detailed vendor profiles and conduct the comparative analysis found in Sections V and VI. We submitted each profile and the relevant sections of the comparative analyses to each vendor to review for factual errors. The last step in our analysis was speaking with buy-side references provided by most vendors to help inform us of the strengths and weaknesses of each provider. Buy-side feedback enabled us to finalize the vendor profiles, comparative analysis, and relevant vendors sections of the report. Because bundled commission payments for research are deemed an inducement under MiFID II, asset managers must either pay for research from their own P&L or implement a series of measures designed to manage the conflict of paying for research using client assets. These new regulatory requirements have created a market opportunity for vendors to develop solutions which would help asset managers meet these research procurement rules. 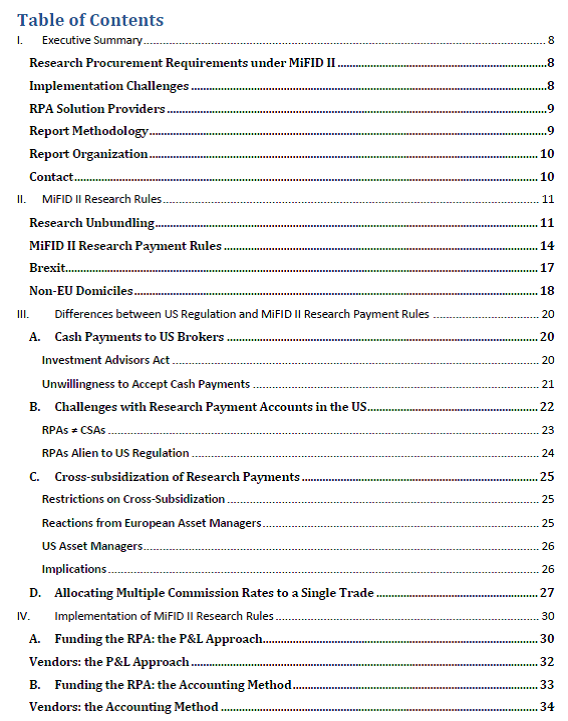 For this report, Integrity Research conducted extensive reviews of ten (10) firms that currently provide or are developing research procurement solutions for asset managers subject to MiFID II’s proposed rules banning the use of bundled commissions to pay for research. The solutions providers fall into two categories: Fintech software firms and agency brokers that have experience offering commission aggregation, and/or commission management services. We have termed one group of these firms “Research Procurement Solution providers” (RPS providers) which offer specialized software addressing governance requirements associated with RPAs such as research budgeting, valuation, or reporting. Research Procurement Solution providers covered in this report include Castine Consulting, Commcise, FrostRB, and Investars. We refer to the second group of firms as “RPA Administrators” because a key part of their service entails setting up research payment accounts (RPAs) on behalf of asset manager clients. The RPA Administrators are set up to manage much of the RPA activity for clients, including conducting any relevant due diligence, making payments to research providers, and reconciling these accounts. These firms also address many of the RPA governance requirements that RPS providers offer. RPA Administrators reviewed in this report include Bloomberg Tradebook, IHS Markit, Instinet, ITG, Liquidnet, and Westminster Research Associates. Integrity Research reviewed the offerings of each of the ten providers discussed above through demonstrations of the software and services, questionnaires, extensive interviews, and feedback from users of their services. 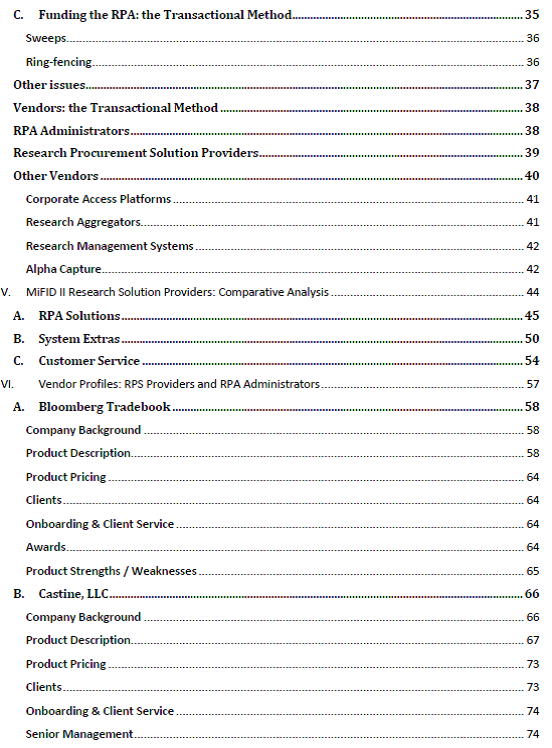 The results of our analysis are presented in detailed profiles on each of the firms and the RPA solutions they offer including our view of their strengths and weaknesses; comparative analysis of each product / service; and suggestions on which vendors might be the best fit for asset managers depending on their specific needs or requirements.